Bowing to public concern about a proposed transit hub in downtown Ketchum, city officials are taking a step back to consider alternatives. 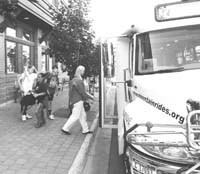 In an open letter to citizens published in the Idaho Mountain Express, Mayor Randy Hall announced that the city would extend the timetable for constructing the downtown transportation center. The city also is asking bus operator Mountain Rides Transportation Authority to study different locations for the plaza and gather more data from other resort communities on where their transit facilities are located. The city, in conjunction with Mountain Rides, is hoping to build a plaza to increase ridership, improve safety for riders, bicyclists and pedestrians, and to consolidate bus stops to make it easier for locals and visitors to navigate the system. After studying potential sites, the city announced earlier this year that East Avenue between Sun Valley Road and East Second Street was its preferred location. City and transit officials got a taste of discontent last month during a public meeting on the issue, when representatives from Tahoe City, Calif.,-based LSC Transportation Consultants—under contract with the city of Ketchum—presented conceptual ideas for the plaza. Some people lamented the loss of parking spaces so near the core, saying it would be detrimental to already struggling businesses. Others said putting more time and resources into public transportation is unwarranted. Other attendees, however, supported the idea, saying the hub would increase downtown vitality and promote economic development. "We are pleased with the amount of community participation," Hall said in the statement. "It is important to understand that no decisions will be made until all alternatives have been thoroughly reviewed. While most people agreed with the need for a transportation center, the public and council wanted more study and discussion on the location and time frame." Mountain Rides has asked for $50,000 from the city and the Ketchum Urban Renewal Agency for the matching-funds portion of a $200,000 U.S. Department of Transportation grant for the plaza's construction. In addition, Mountain Rides could contribute between $20,000 and $40,000, plus staff time, for the project, said Executive Director Jason Miller. Ultimately, the City Council would have to approve the use of the street. The design of a waiting-area building would go through the Planning and Zoning Commission, and Mountain Rides would have to approve operational changes. Information is available at www.mountainrides.org or www.ketchumidaho.org. To comment, contact Mountain Rides at 788-7433 or info@mountainrides.org; or the city of Ketchum at 726-3841 or lhorowitz@ketchumidaho.org.